As dentists, it is our primary goal to support the long-term health of your mouth, including your teeth and gums, and helping you to retain your natural teeth for as long as possible. However, even with the greatest and most consistent brushing and flossing routine, some decay, damage and other dental problems are virtually inevitable over time. In cases where the decay or damage is extremely bad, a tooth may fall out of its own accord. Other times we may decide that the tooth cannot be saved and extraction is the best course of action to preserve the health of the other teeth, mouth and gums. Does a tooth extraction mean that I am going to be left with an ugly gap? Many people wrongly assume that a tooth extraction will leave them with a noticeable and unattractive gap. While extractions that take place near the front of the mouth can be embarrassing, many patients who lose a tooth further back in their jaw find that the gap is barely noticeable. However, addressing a gap should be a priority as it will prevent other teeth from migrating to take up the additional space, creating gaps of their own. Filling the gap can also help to prevent it from becoming a pocket that attracts food debris and other decay-causing bacteria. - First/infant teeth that fail to come out of their own accord and make way for erupting adult teeth. - Removing additional teeth that may cause problems with tooth eruption and alignment. - Fitting an orthodontic brace. - The patient is at risk of infection due to conditions such as suppressed immunity, cancerand other health-related problems. How is an extraction performed? 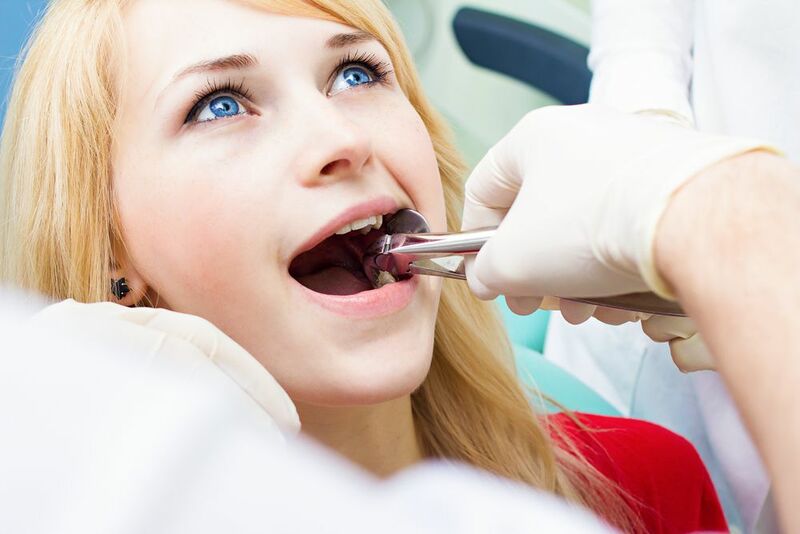 There are two types of tooth extraction, although both are performed using a local anesthetic. A simple extraction is usually tried first and foremost because, as its name suggests, it is the easiest and most straightforward way of removing a tooth. In a simple extraction, you can expect your dentist to use a special tool known as an elevator. This helps to widen the pocket that the tooth sits in, making it looser and easier to grab. A miniature pair of forceps can then be used to gently pull the tooth free. If your extraction looks like it is going to be more complicated, for example if only part of the tooth is visible because it is impacted, then a surgical extraction may be necessary. This will involve making an incision in your gum to make the tooth accessible for removal. Any incisions are closed with sutures that will either dissolve of their own accord, or be removed by your dentist at a later date. As mentioned above, tooth extractions are always performed using a local anesthetic. This means that you will not feel any pain, but you may feel some pressure and movement as the dentist works to free your tooth. Dental anxiety is very common, and we strive to make our patients feel as comfortable as possible during any procedure. If you are particularly nervous about a tooth extraction, it may be possible for you to be sedated. Please enquire about this service when you come for your consultation appointment. Whether you have had a simple or a surgical extraction, what happens after your procedure will be similar. You may be in some discomfort for the first couple of days after your extraction, and regular pain medications and anti-inflammatory drugs should help to alleviate this. Many patients also use cold compresses held against the jaw to help reduce swelling and ease their pain. For at least a few days after your surgery, your diet will be limited to soft food as this will be the most comfortable to eat. You can then gradually introduce more foods from your normal diet. You should also avoid smoking and using a straw for a minimum of 72 hours after your extraction. If you have had a surgical extraction then you may experience a small amount of bleeding during the 24 hours immediately following your procedure. A clot should form on the wound, and this should be left alone as it will prevent the bleeding from worsening. If you have had non-dissolving stitches then when you leave our office, you will be given a date to return to have these removed. If you have any questions about tooth extractions, Dr. Haws and our professional, knowledgeable and reassuring team would be happy to advise you further. Please do not hesitate to give us a call, or pop in and see us at our modern, comfortable Brigham City offices.